Hands up then. Who remembers Buzby? This cheerful bird first appeared in 1976 as part of a marketing campaign for Post Office Telecommunications, who later became part of British Telecommunications. His main aim was to get us to use the telephone more, and I think he did that. Voiced in the TV adverts by the legend that is Bernard Cribbins, Buzby became a bit of a star, with loads of marketing items produced, including toys and badges. He also spawned a cartoon strip in TV Comic. At some point along the line his feather changed from yellow to orange (maybe it was an age thing?) but still he remained a hit. With the strap line “make someone happy with a phone call” I wonder if BT could bring back Buzby today as part of a marketing campaign to get people actually talking to each other again rather than just sending messages. During one of my usual secondhand bookshop trawls I came across the Buzby Annual and knew it had to come home with me. 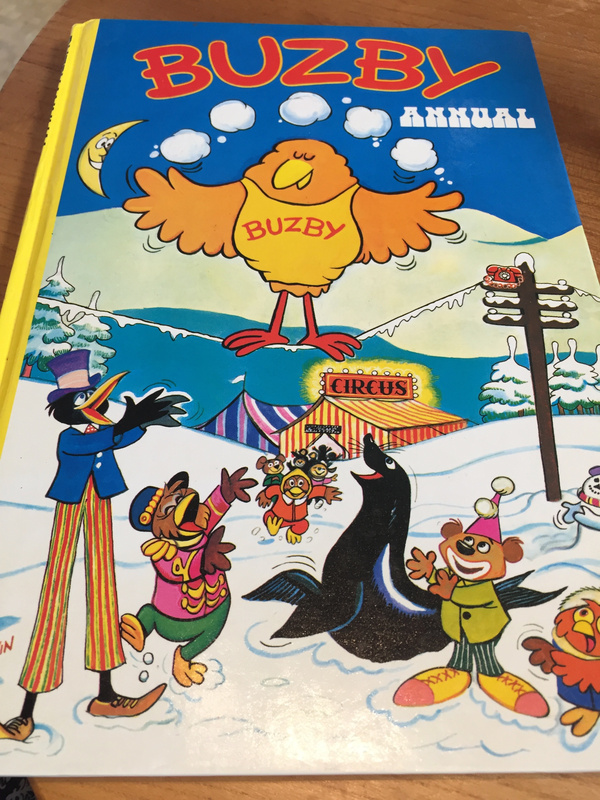 A spot of internet research tells me that there were two Buzby Annuals produced. This one in 1979, and then a second version in 1980. As a child of the 80s annuals were very much a standard Christmas present. Something that we always looked forward to receiving, whether it be a Blue Peter one (another of my collecting habits) or one from a favourite band or TV programme. I’m not sure how many came out celebrating the start of advertising campaigns though. 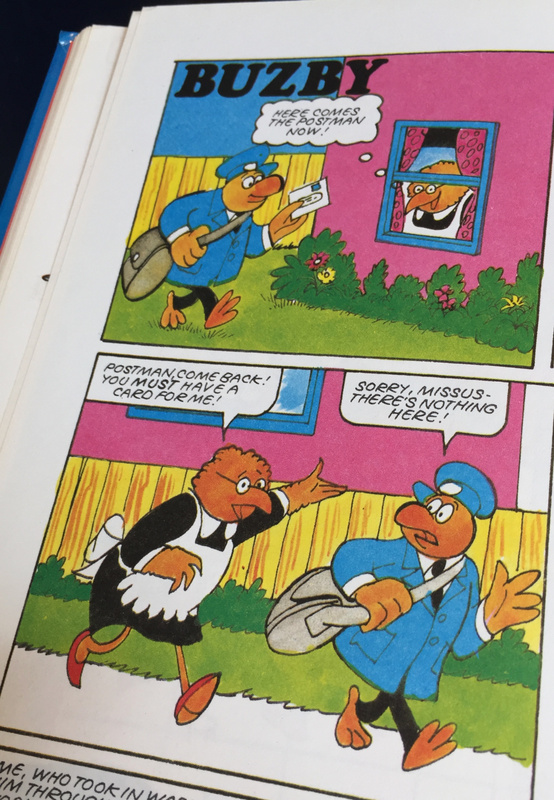 The Buzby Annual includes many of the features that you came to expect in annuals of the 70s and 80s. A mix of cartoons, longer stories, puzzles and a few educational features. The stories obviously featured Buzby, whilst the games and puzzles revolved around a theme of telephones. 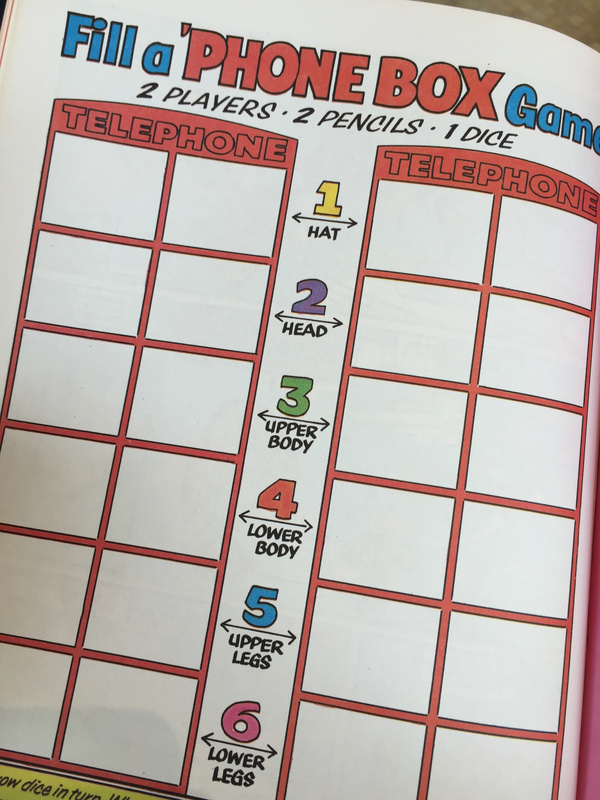 Everything from spotting telephone handsets in a picture through to the “fill a ‘phone box game”. There’s a page of telephone related jokes and puns, as well as photos of telephone handsets from years gone by. The copy of the annual I found seems to be in immaculate condition considering it’s age. Inside the front page the corner containing the price has been cut off (as was normally the way with annuals given as gifts at Christmas) but the only other sign that it’s ever been read is the crossword that has been completed inside. 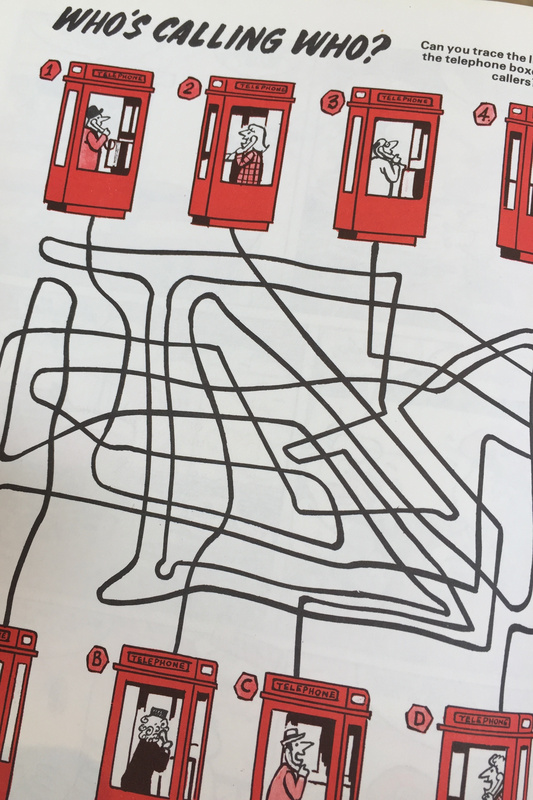 There are plenty of games in the book that would have required the owner to cut the pages – something I felt uneasy doing, even as a child – and I was quite relieved to see that this hadn’t been done. I’ve no idea if modern day annuals ask kids to do the same or not, but in my mind scissors and a book should never, ever meet! That’s what I’ve been wondering since picking this up. Was he really that big a star back in 1979 that he merited an annual on the bookshop shelves next to ones for Blue Peter, Football magazines and favourite bands? Then again, I recall an annual for a local radio station that I picked up in childhood from a car boot sale and that must have been a pretty niche market. ‘Fess up. What annuals do you remember having as a child?